KELO-COTE® Scar Treatment - Got A Question? How soon can I use KELO-COTE® after injury? It is best to use KELO-COTE® after the wound has healed and there are no scabs remaining, or after your sutures are removed. With burns you need to wait until the skin has healed over. Will KELO-COTE® make my scar disappear? KELO-COTE® advanced formula is designed to improve the physiological and cosmetic appearance of the scar. We cannot guarantee that it will make your scar disappear completely. Is KELO-COTE® suitable for children? Yes, KELO-COTE® is suitable for use on children from 3 months of age. How long do I need to use KELO-COTE® for to see an improvement? The recommended minimum treatment time for KELO-COTE® is 60 to 90 days. If you continue to see improvement at the end of the 90 days you can continue treating your scar. For older scars it is likely that you will need to continue for longer than 90 days. Does KELO-COTE® offer sun protection for my scar? KELO-COTE® Scar Gel UV has added SPF 30 to protect scars from the aggravating effects of the sun. It is important to reapply sun protection to the scar. Will people notice KELO-COTE® on my skin? KELO-COTE® spray and gel are colourless and invisible when dry. KELO-COTE® UV is slightly cloudy due to the inclusion of the UV. Does KELO-COTE® prevent scars from forming? KELO-COTE® helps prevent scars forming but it is important to use it as soon as the wound is closed or sutures are removed. Is KELO-COTE® effective only on new scars? KELO-COTE® is most effective on new scars and immature scars up to 2 years old. There is some evidence to show that the product can be effective on scars up to 4 years old. Can KELO-COTE® be used on the face and body? Yes, KELO-COTE® is suitable for external use on your face and body. Avoid direct contact with eyes, mucous membranes, third degree burns and open wounds. What is the difference between KELO-COTE® silicone gel and silicone sheets? KELO-COTE® is an advanced formula silicone gel which is easily applied directly to the scar, and self-dries quickly. It can be used on joints and doesn’t restrict movement. KELO-COTE®’s formula ensures that it adheres to the scar, unlike sheets which often require sticking in place. Silicone sheets may be less convenient to apply, particularly on joints and can restrict movement. Also KELO-COTE® is transparent and will be less visible than sheets on exposed areas. Finally, KELO-COTE® does not require removal and washing like sheets. 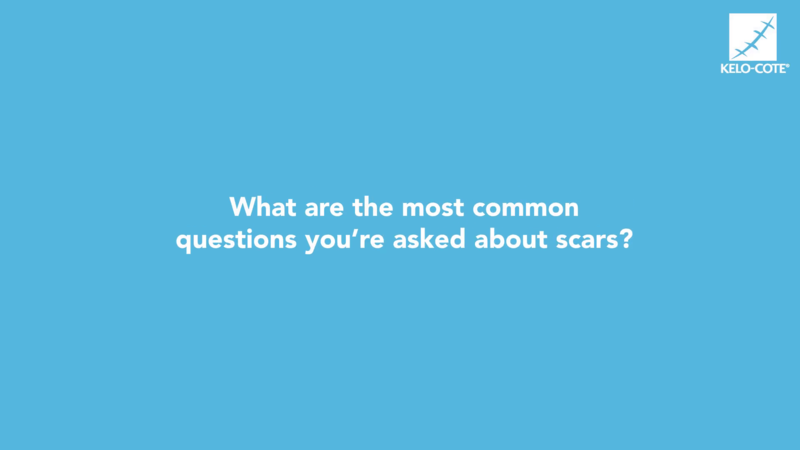 The choice between silicone gel and sheeting is based on many factors such as the size and location of the scar and individual preference, your healthcare professional will be able to help you decide which is most appropriate for your scar. Yes, KELO-COTE® dries to form a thin, water-impermeable silicone layer. Can I apply make-up over KELO-COTE®? Yes, but ensure it has dried first. How long does KELO-COTE® take to dry? If you apply a very thin layer as advised in the instructions it has been shown to dry within 5 minutes*. If it doesn’t it will mean that you have used too much and it is recommended that you wipe off the excess. *Data on file, study of 10 subjects. When used in accordance with instructions. Where can I buy KELO-COTE®? KELO-COTE® is available from Amazon.co.uk and your local pharmacy. What type of scars is KELO-COTE® suitable for? KELO-COTE® is suitable for keloid, hypertrophic and burn scars. What is different about the spray version? The spray version is designed for scars which are larger and more uneven. It is also suitable for scars which are sensitive to touch, such as burn scars. The spray is also hygienic to use as there is no need to touch the scar. How often should I apply KELO-COTE®? It is recommended that you apply twice per day–to provide day and night protection for your scar. How do I open the KELO-COTE® tube? For the 6g and 15g tube you will need to cut the very end of the tube with a clean pair of scissors before first use. For the 60g just peel off the foil seal. Make sure you re-apply the cap after use.